Families who needed a vehicle to carry more than six passengers comfortably used to choose minivans. Those days are over. These days, there are many SUVs available that offer three row seating – allowing drivers to benefit from the style, features, and performance that come with an SUV, without sacrificing the seating needs of an expanding family. Crossovers have significantly improved over the last few years in functionality, design, performance as well as gas mileage. Most of the vehicles discussed here feature optional third row seating. That is, the extra seats do not always come standard with the vehicle. These five are the best models when assessed for the following: reliability, buyer reviews, safety, interior features and the retail price of the vehicle. Each has the ability to seat between 7 and 9 passengers. 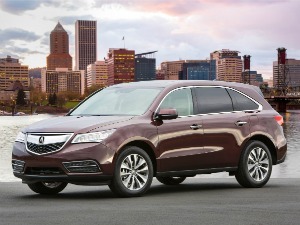 U.S. News and World Report awarded the 2014 Acura MDX the Best Luxury 3 Row SUV for the Money. With a standard V6 engine, a six speed automatic transmission and smooth shifting, this vehicle has plenty of power for a vehicle that offers good fuel economy. The EPA estimates the gas mileage to be an impressive 20/28 mpg city/highway. It also includes features privacy glass, power windows, power tilt sliding sunroof and moonroof as well as a rear spoiler. Safety features include brake assist, electronic stability control, daytime running lights, integrated turn signal, and traction control. The starting price of $42,290 is competitive for a vehicle in this class and includes seating for 7. The Nissan Rogue was redesigned for 2014 to provide ample cargo space, great fuel economy and a sleek cabin, but test drivers tend to be unimpressed with the 4-cylinder engine that comes standard with this vehicle. That said, it gets the best fuel economy in its class. The 2014 Rogue gets 26 mpg in the city and 33 mpg on the highway. Its zero-gravity seating technology reduces driver and passenger fatigue and provides exceptional comfort. The redesigned interior’s most notable change is the upgrade from hard plastics to soft-touch materials. Standard features include Bluetooth, hands-free text messaging, an auxiliary audio jack, a USB port, and a rear view camera. Optional features include a navigation system, push-button start, a nine-speaker Bose stereo system, dual-zone automatic climate control, and a panoramic moonroof. A favorite feature among test drivers is the optional AroundView monitor that combines the images from four different cameras to give drivers a complete 360 degree view around the vehicle when parking. The standard third row seating is not designed for large individuals, but provides ample space for small children. The 2014 Nissan Rogue’s starts at $22,790. The 2014 Hyundai Santa Fe is the Best 3 Row SUV for the Money. Like the Nissan Rogue, it comes with a standard 4 cylinder engine that reviewers rate as adequate, and a standard six-speed automatic transmission. The well designed cabin features lots of soft-touch materials, ample cargo space, comfortable seating, a six-speaker stereo, Bluetooth, a USB port and Hyundai’s Blue Link telematics system. Available upgrades include an 8-inch touch screen display, dual-zone automatic climate control, blind spot monitoring, and rear parking sensors. Like most crossovers with third row seating, the extra seats are designed with children in mind and will probably be too small to comfortably fit adults. 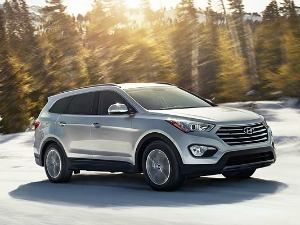 The 2014 Hyundai Santa Fe’s retail price starts at $24,950. 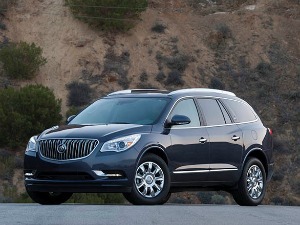 The 2014 Buick Enclave was named the Best Option for Families. The Enclave comes standard with a V6 engine and six-speed automatic transmission, but the fuel economy is only average at 17/24 city/highway (considerably lower than the MDX). 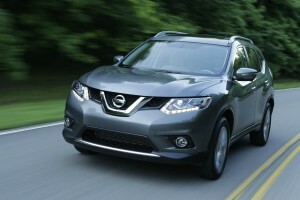 This midsize SUV can seat up to 8 people, and has abundant cargo space. The interior is made of high-quality materials and comes with high-tech standard features such as Buick’s IntelliLink infotainment system, Bluetooth, a USB port, satellite radio, a backup camera, rear parking sensors and tri-zone automatic climate control. Optional features include: 10-speaker Bose stereo, navigation, forward collision alert, lane departure warning, blind zone alert and a rear-seat entertainment system. Unlike many of its competitors that have standard seating for 7 passengers, the third row seat provides enough space to comfortably sit average-size adults. The 2014 Buick Enclave starts at $38,890. 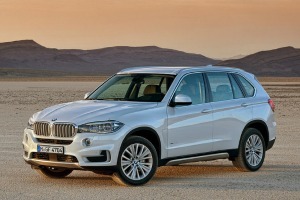 The BMW X5 was redesigned for 2014. Like one would expect from any vehicle made by BMW, it features plenty of style, an elegant interior, excellent handling, and a powerful engine. The standard X5 xDrive35i has a turbocharged six-cylinder engine and it gets 19/27 mpg city/highway, which is decent fuel economy for such a powerful SUV. Seating is roomy, comfortable and made of high-end materials. Standard features of the BMW X5 include a panoramic moonroof, a navigation system, BMW’s iDrive infotainment system, leatherette upholstery and power-adjustable heated front seats. Optional features include upgrades to leather upholstery, a 360-degree SurroundView parking camera system, lane departure warning and a night vision system with pedestrian detection. Like many other vehicles with 3 rows of seats, the extra seats provide enough space for children, but adults will probably have a hard time using them without feeling squished. The 2014 BMW X5 has a base MSRP of $52,800. These five 3 row SUVs represent the best 2014 has to offer in terms of design, style, function, comfort, price, and safety features. They range in price from $22,000 to $52,000 so it’s easy to find an option that fits your budget and requirements. SUVs and crossovers are the perfect choice for anyone who wants plenty of seating without sacrificing performance.